14 oz. 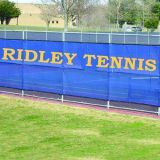 woven, extrusion vinyl coated polyester mesh wind screen. Fabricated with IncrediSeal™ heat sealed hem providing a clean look and eliminating the risk of stitches or seams coming undone! Provides 75% shade. Wind vents and cable ties sold separately. 6' High. 5 year warranty. Specify color when ordering. Graphics and lettering available separately, please call Jaypro for details. 14 oz. woven, extrusion vinyl coated polyester mesh wind screen. Fabricated with IncrediSeal™ heat sealed hem providing a clean look and eliminating the risk of stitches or seams coming undone! Provides 75% shade. Wind vents and cable ties sold separately. 9' High. 5 year warranty. Specify color when ordering. Graphics and lettering available separately, please call Jaypro for details. 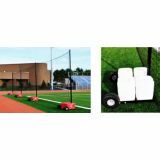 Ideal where in-ground netting systems are not appropriate. 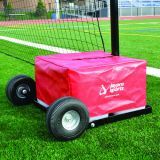 Four 12' H, 2-3/8" diameter aluminum poles are easily transported on a tip and roll base which has four 5 gallon jugs (filled in the field) and two 10" diameter "no-flat" tires. 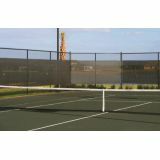 Includes corrosion resistant hardware, cable clamps and sliding rings for easy net assembly. 12' H x 60' L Multisport, 1-3/4" square mesh #36 knotted nylon netting. Includes 4 vinyl base covers. 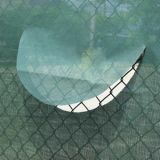 An attractive yet economical wind screen that will meet all of your privacy, wind and background needs. Can also be used as a dugout canopy! Open mesh 8.2 oz/sq yd. 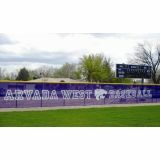 PVC coated polyester provides up to 84% shade. Includes reinforced hems and rust resistant grommets spaced at 18" intervals.18" dia. half moon wind vents are recommended to allow for wind passage, purchased separately. Plastic cable ties for installation are purchased separately. 6' High. 3 year warranty. Specify color when ordering. Graphics and lettering available separately, please call Jaypro for details. Half moon wind flaps for wind screen. Recommended every 10'. Plastic cable Ties for wind screen attachment. Bag of 100. Optional vinyl base cover attaches with hook and loop over the weighted base.